Following information that the comet is appearing brighter than had been predicated, we made a hasty observation between cloud gaps in the early hours of 2018 September 24. There was insufficient time in which to set up the EQ6 mount with which we are accustomed to using large, fast Nikkor telephoto lenses (400mm f/ 2.8, 500mm f/4, 600mm f/4 & 800mm f/5.6) in combination with a digital SLR D800, so we resorted instead to an EQ3 mount with a modest combination of 135mm f/2.8 and 180mm f/2.8 with a SLR D300. The observations were made between 03h 30m and 03 40m UT. Conditions were far from ideal with high cumulus forming and passing with a Moon (phase 99%) in Aquarius (fortunately close to setting at an altitude in the west of some 8°). Data: exposure 15 sec. at f/ 2.8 ISO 2000. Time: 03h 37m UT. Altitude of comet: +30.4°.Field diameter: 3°. Stars to mag. 12.5. The bright star close to the comet is 15 Monocerotis, variable with a mean magnitude of 4.6, spectral class O7. 2014 March 26. Comets LINEAR & Lovejoy update. Early morning observation in quiet conditions (curlews and snipe adding to the audible background magnificently) with astronomical twilight beginiing to show in the east. Good transparency and seeing. Comet Lovejoy imaged 2014 March 26 at 03h 38m UT. A 39.0 sec, exposure. 150mm aperture f/5 achromat. D800 SLR, ISO 2000. Brightest star in field (dia. 34') is TYC 5120-216-1 mag.8.56. Stars to mag. 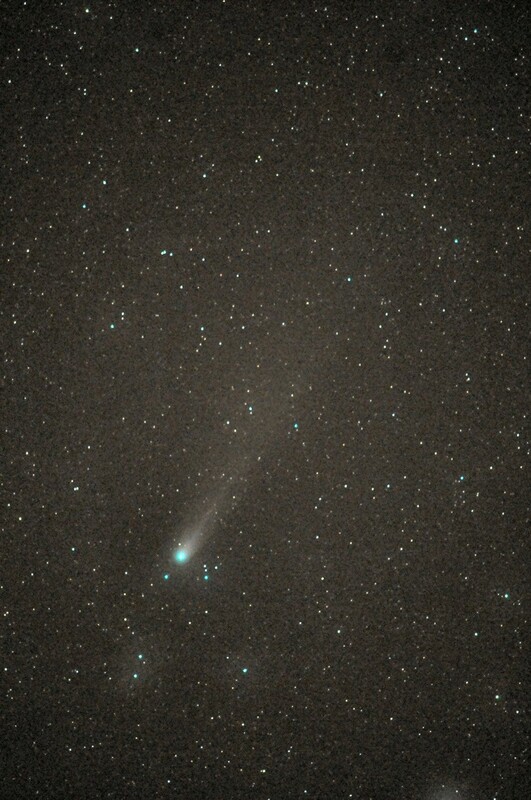 16 are visible despite the comet’s low altitude and the commencement of morning astronomical twilight. 2014 March 05. Comets LINEAR & Lovejoy update. 2014 March 05. Early morning observations of comets Lovejoy and LINEAR following a night of sporadic spells of clear sky (observations of M82 earlier). Fortunate to have a short window of opportunity for the two comets in the SEE at low elevations, the comets now having passed south of the celestial equator. With rapidly advancing dawn twilight by the day, and the comets' decreasing altitude as they move south, we expect these two observations to be the last we shall secure from Orkney. C2012 X1 (LINEAR) imaged 2014 March 05 at 03h 58m UT. Nikkor 600mm f/4. A 40.2 sec. exposure D300 SLR ISO 2000. Cropped image: the brightest star in the field (dia. 62' approx.) is STF 2533 mag. 7.34 spectral class A3. The star appearing adjacent to the comet is TYC 5131-453-1 mag. 12.3. C2013 R1 (Lovejoy). Imaged 2014 March, 03h 54m UT, 150mm f5 aperture achromatic. A 42.8 sec. exposure D300 SLR ISO 2000. The brightest star in the field (dia. 50' approx.) TYC 5112-219-1 mag. 7.07, spectral class B8. 2014 February 28. Comets Lovejoy & LINEAR update. 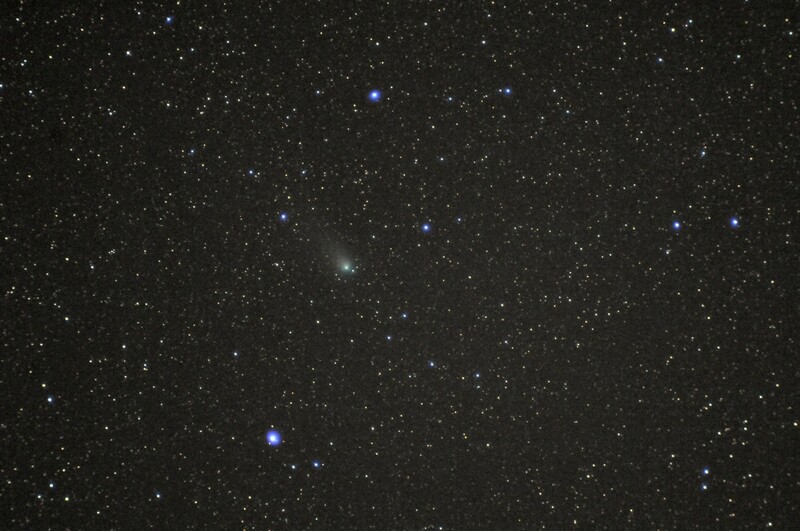 Comet LINEAR imaged 2014 February 28 at 04h 02m UT. mag. 6.40, spectral class K0II-III. 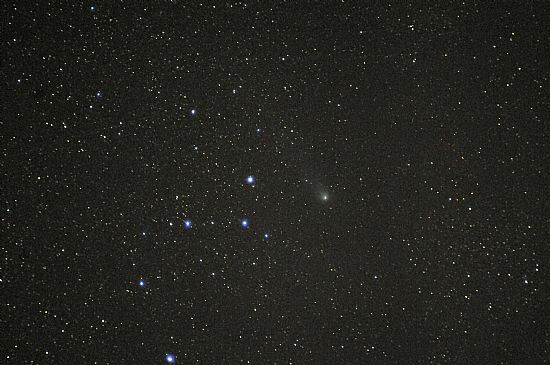 Comet Lovejoy imaged 2014 February 28 at 04h 06m UT. A 47.5 sec, exposure. 150mm aperture f/5 achromat. D300 SLR, ISO 2000. The brightest star in the field (dia. 1°.1 approx.) is TYC 446-185-1 mag. 8.36 spectral class F2. 2014 February 10. 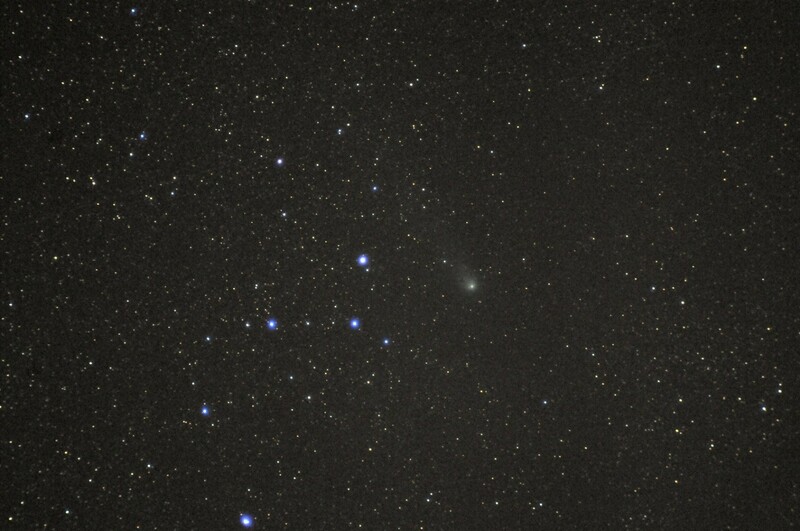 Comets Lovejoy & LINEAR update. Comets Lovejoy & LINEAR just past conjunction (in celestial longitude) and looking a comparable pair as the former has faded and the latter brightened. Another morning of challenging conditions, this time with cloud forming and dispersing rapidly on a slack SSW airflow. Further, moonset was not until 05h 03m UT which gave only about 40 minutes before twilight set in. So, the morning (this morning) of the 10th could well be the last opportunity for imaging the comets before they have both faded, with “shrunken” tails to boot! 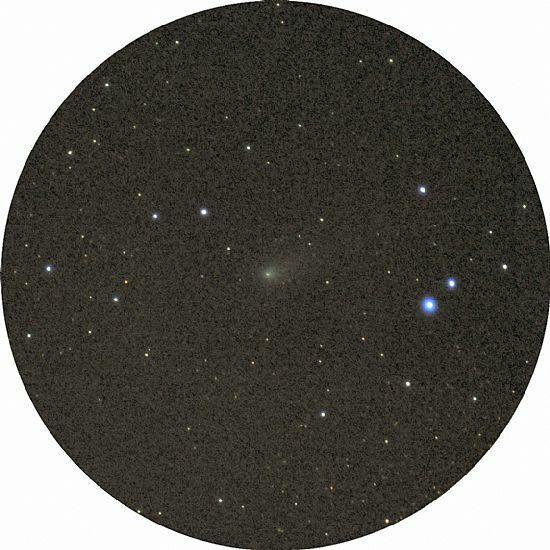 The objective this morning was to image both comets and the nova in M82, the two former appearing close together but with the galaxy somewhat west of the zenith. The technique was to literally “hop” from one part of the sky to the other as windows of opportunity presented themselves. It was decided to use the 150mm aperture f/5 achromat since positional stars are more readily found (finder telescope attached) and with 750mm focal length a reasonable field scale cold be secured for all three objects. C2012 X1 (LINEAR) ) imaged 2014 February 10 at 05h 22m UT. A 40 sec. exposure D300 SDLR ISO 1600, 150mm f/5 achromatic refractor. The brightest star in the field is TYC 437-2244-1, mag. 6.07, spectral class K3III. This star should appear decidedly yellow/orange. 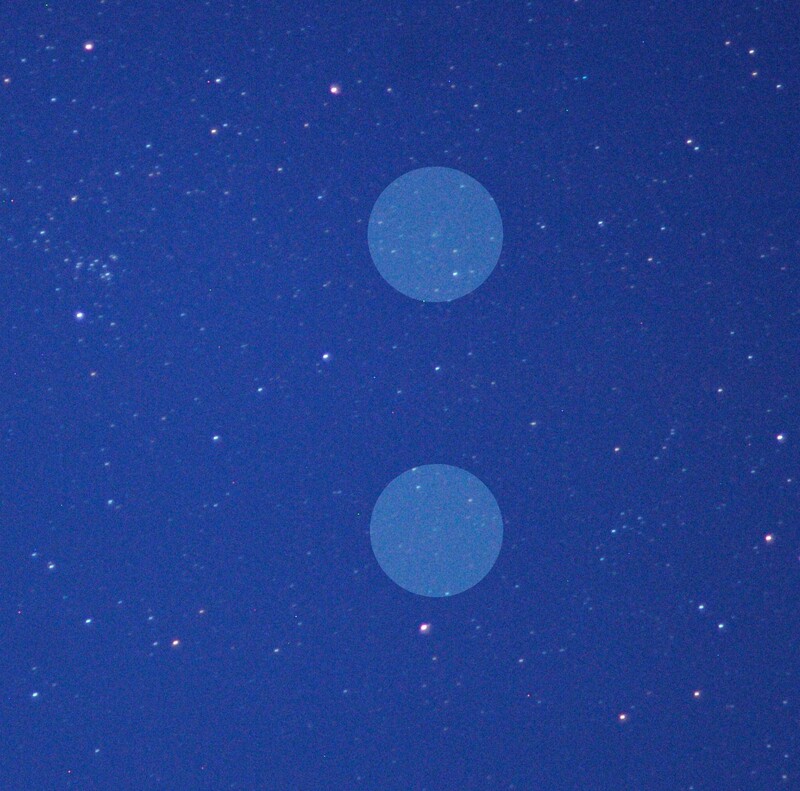 The image is in fact blue, demonstrating the inferior colour correction for this lens. Field: 1°.4 x 0°.9 approx. 2014 February 07. Comets Lovejoy & LINEAR in constellation Ophiuchus. Readers will see from the Sky View page that these two comets are in conjunction on February 08. 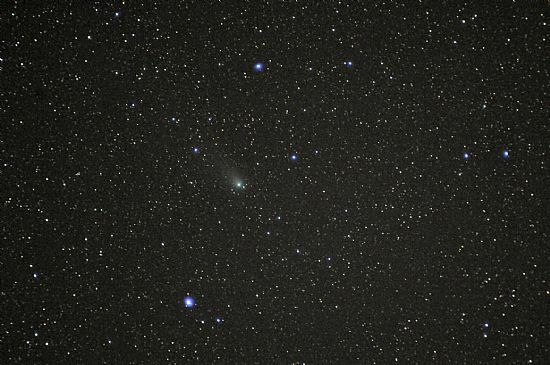 With the very poor weather over the past few three weeks it has so far proved impossible to image the two comets from Orkney since January 12. This morning proved frustrating since up to around 05h the sky had been cloudy most of the time. Only after around 05h 50m did conditions show any real sign of improvement, by which time morning twilight was well underway. This gave insufficient opportunity in which to set up the equipment for detailed study and so one had to be content with a static camera using a short focus, fast lens, namely 105mm f/1.8. The image below shows the two circular regions (1° Dia. approx.) 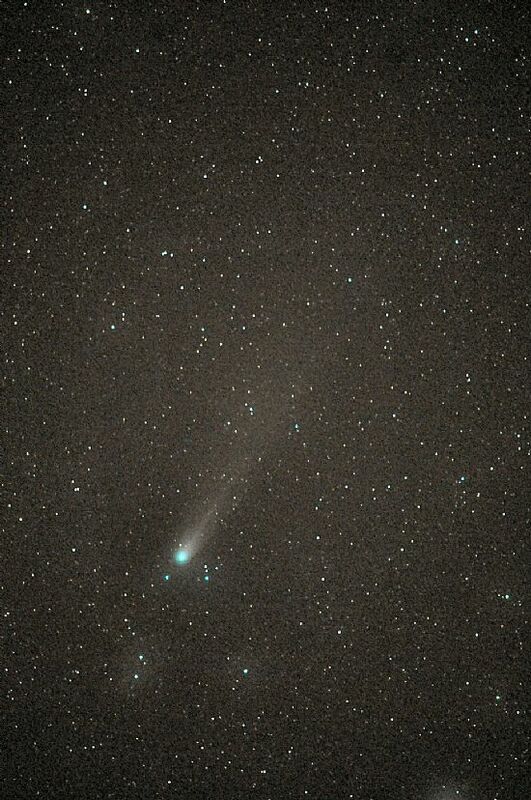 highlighted with the comets at the centre (Lovejoy top, LINEAR bottom). The brightest star in the top circle is TYC 444-404-1 mag. 7.34, and in the lower circle above close to the perimeter is TYC 440-3677-1 mag 8.19. 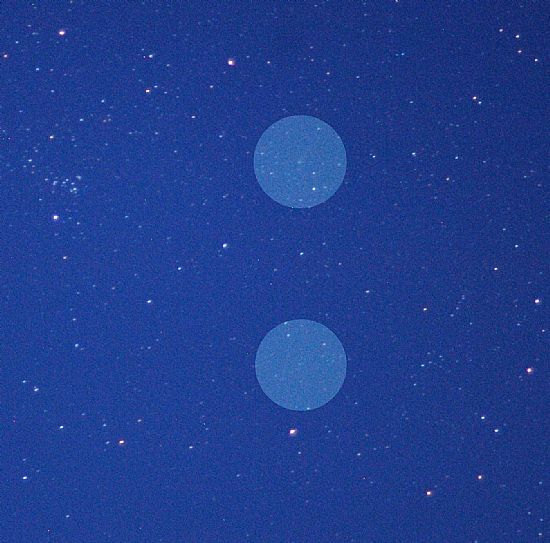 These may not be spectacular images but they at least enable one to assess the brightness of the two comets. As expected, Lovejoy has faded significantly whilst LINEAR, if anything, has increased a little in brightness. This exercise should encourage some folk into making useful observations with very basic equipment. 2014 January 12. Early morning observations of comets Lovejoy and LINEAR, initially in a sky of moderately good transparency but varying with high cloud drifting across on a light S wind. This shows on most images causing “haloes” around the brighter stars in the field. On high resolution images, the coma still shows sign of extension from its outburst in late 2013.